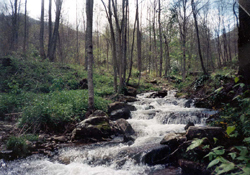 The Villages of Plott Creek consists of 1,100 acres of wilderness located in the Balsam Mountains and offers one of the most scenic Waynesville NC real estate bargains. Spectacular views, rushing creeks and abundant wildlife are all part of life at the Villages, along with paved roads, security gate and just 5 minutes from downtown Waynesville … The best of all worlds. Security gate – opens at 6 a.m. and closes at 6 p.m.